U-Shape Kitchens are continuous kitchen layouts that locate cabinetry and fixtures along three adjacent walls in a U-Shape arrangement. Flexible for multiple variations of lengths and depths, U-Shape Kitchen designs often incorporate central island counters for increased work space and table surfaces. A minimum central width of 5’ | 1.53 m must be provided for use, but it is recommended that this zone be enlarged to between 6’-8’ | 1.8-2.4 m to provide sufficient access and movement space for multiple people. U-Shape Kitchens have widths that range from 9’-12’ | 2.7-3.7 m and depths that vary as desired. U-Shape Kitchens should be planned with an overall area of roughly 107 ft2 | 10 m2. What is a U-Shape Kitchen layout? U-Shape Kitchens are kitchen layouts that place cabinetry and fixtures along three adjacent walls. U-Shape Kitchens are flexible and are often paired with a kitchen table or a central island. How much clearance is required in front of an U-Shape Kitchen? 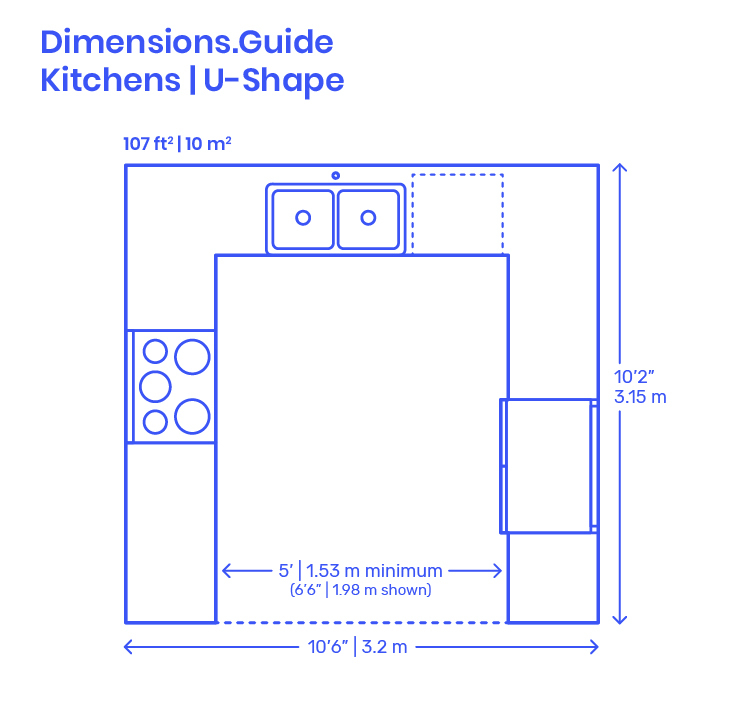 U-Shape Kitchens must have a minimum central clearance of 5’ | 1.53 m, but it is recommended that this zone be enlarged to between 6’-8’ | 1.8-2.4 m to provide sufficient access and movement space for multiple people. How big is a U-Shape Kitchen? U-Shape Kitchens should be sized with an estimated area of around 107 ft2 | 10 m2. Common widths of U-Shape Kitchen layouts range from 9’-12’ | 2.7-3.7 m with depths that vary as necessary.